Consanguinatas: The Ceremony of Opposites was a performance undertaken on October 24, 2015 by myself and Luna Duran as part of the larger Lilith: Myth to Flesh project. Lilith: Myth to Flesh is an invocation to the ineffable spirit whose dominion is shadows. This spirit gives rise to the darkest of life’s moment. Its transformative powers are often overlooked due to our fear of the unknown, which lies in wait for us in that darkness. Our project is an exploration of that darkness. In order for us to do justice to that spirit, we needed to open ourselves to receive it without attempting to manipulate or subdue it. We knew that our performance, our celebration of the completion of our project, must be true to this dark and untamable energy. By opening a space in honor of this free spirit, we invited it to reach its fullest expression. Hook suspension and bloodletting ritual facilitated by White Flag Suspension. 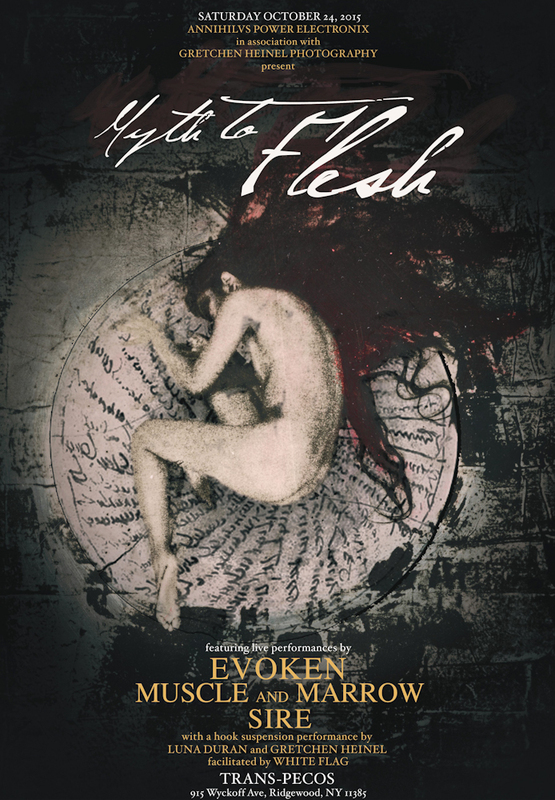 Live musical accompaniment by Evoken, with guest performers Sire and Muscle and Marrow.